To be more is to work hard in search of perfection to transform the world. It is learning to build dreams, innovate to change realities and transcend to serve society. Those who can best explain the feeling of being part of a family are its members. Students, graduates, exchange students, teachers, administrators and authorities share their personal vision of the values that represent what we are and what drives us to be more. 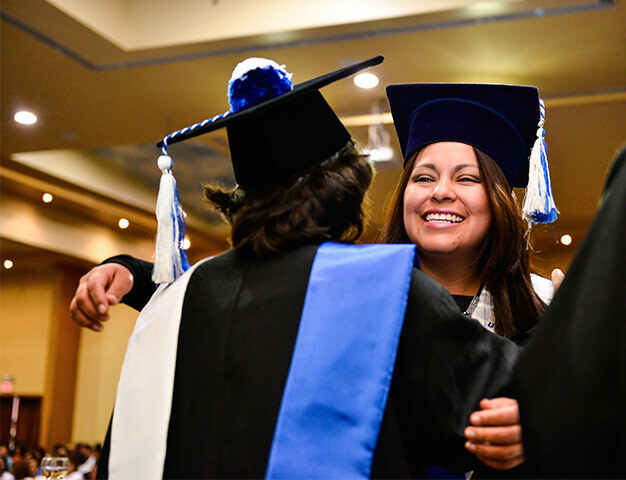 Our 47 years of experience in higher education have made possible the scientific and humanistic formation of more than 65 thousand people in Ecuador and the world who decided to be more through a quality and accessible higher education, guided by the humanism of Christ. We assume the challenge of growing from our origin, with the premise of being better than yesterday, a premise that is part of our DNA and that is embodied in our institutional shield under the phrase "Memento ascendere semper", remember always overcome. Still have not decided your future? Today, decide to be more! An education model that breaks barriers of time and physical space, favoring the university inclusion of more than 36 thousand people. Methodology based on the m-Learning technique for teaching-learning at the technological forefront. Present in the 4 natural regions of Ecuador through 83 centers distributed in the 24 provinces of the country. 55 thousand tablet devices delivered to students since 2013 through our ICT support grant. More than 222 thousand students benefited with electronic bibliographic material as an example of university environmental responsibility. + of 400 strategic alliances with entities both national and international academics make possible student mobility programs with high level universities in Mexico, Spain, the United States, Brazil, Peru, Chile and Italy. Our teaching is capable of transcending distances through international university centers in 3 of the world's major cities: Madrid, Rome and New York. [The UTPL] corresponds to the paradigmatic model that is needed today in Latin America to promote development. Investigate, innovate and undertake are the pillars that drive our teaching methodologies. Our results, focused on generating practical projects that transform the world from the academy, make us one of the main poles of scientific research and technological development in Ecuador.